When you volunteer to become a HopeRaiser for Resounding Hope, you are affirming your personal commitment to support the people of Haiti. 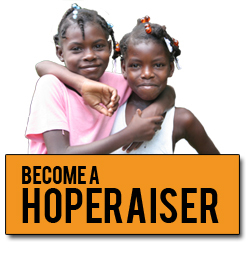 HopeRaisers play an important role in our mission by helping raise funds to sponsor solar radios tuned to Radio 4VEH. We’re aiming to distribute 160,000 solar-powered radios – with broadcasts reaching roughly one million desperate Haitians in need of hope. But to reach our goal, we need you! Sign up to become a HopeRaiser and receive your personal online fundraising webpage where friends and family can show their support with a secure donation. Fundraising has never been easier! With Resounding Hope’s online fundraising tools and ideas, it only takes a few simple clicks of your mouse to help spread God’s Good News across Haiti.